Home / News / Netizens react to President Duterte’s Policy of Crushing Smuggled Cars: "It's a waste of resources!" 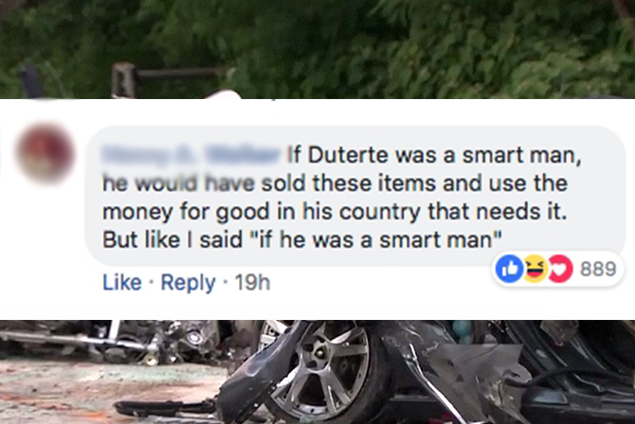 Netizens react to President Duterte’s Policy of Crushing Smuggled Cars: "It's a waste of resources!" Last Monday, July 30, 2018, President Rodrigo Duterte led the destruction and personally saw the annihilation of smuggled cars at Port Irene in Sta. Ana, Cagayan, following his policy to demolish smuggled luxury vehicles to discourage smugglers. 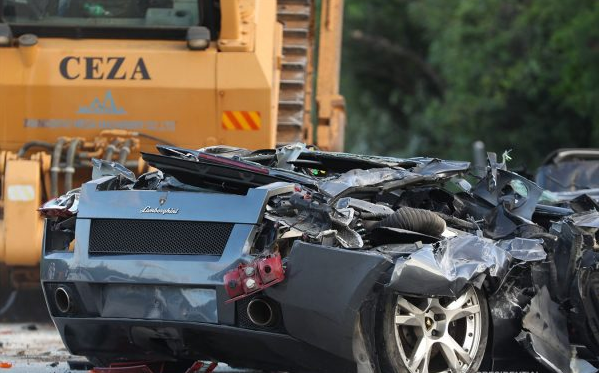 Among the luxury cars destroyed by bulldozers were top of the line vehicles like Mercedes-Benz, Porsches, Jaguar St, Ford Mustangs and Lamborghini Gallardo. However, the said condemnation of smuggled luxury cars increased countless perspectives online and drew fire from netizens over the globe, with a lot of people posting their responses. 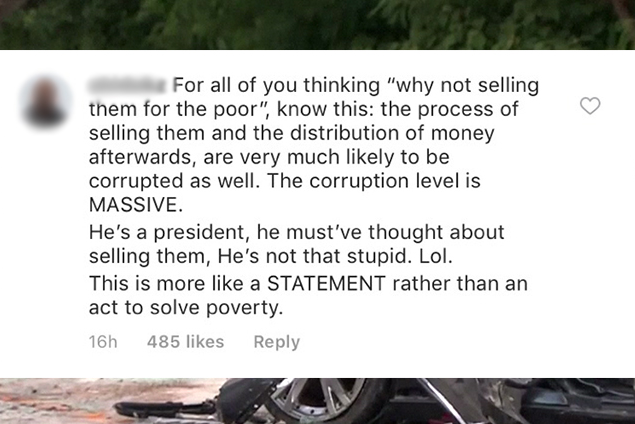 One netizen scrutinized President Duterte's intelligence for not thinking about selling the vehicles instead and utilizing the cash for poor people and for the nation. "If Duterte was a smart man, he would have sold these items and use the money for good in his country that need it. But like I said, 'if he was a smart man'", the netizen wrote. While another one expressed his indignation and criticized the policy of the President, calling it the most mindless choice since the money worth of millions can be used rather to fund the administration or police work force. 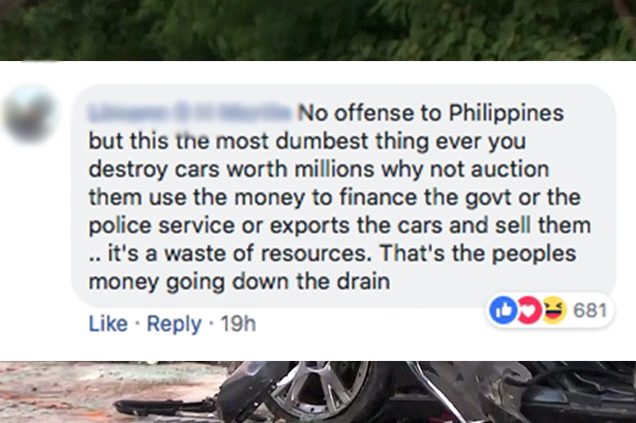 "No offense to Philippines but this is the most dumbest thing ever you destroy cars worth millions why not auction them use the money to finance the govt or the police service or exports the cars and sell them.. it's a waste of resources. That's the peoples money going down the drain. ", another netizen reacted. But in spite of those negative reactions, several netizens also showed support to this policy of the President and pronounced that selling these vehicles off would just instigate and boost corruption. "For all of you thinking 'why not selling them for the poor', i know this: the process of selling them and the distribution of money afterwards, are very much likely to be corrupted as well. The corruption level is MASSIVE. He's a President, he must've thought about selling them, He's not stupid. Lol. This is more like a STATEMENT rather than an act to solve poverty. ", said by one netizen. It has also been reported that the seized contrabands in Cagayan likewise incorporate humvees yet President Duterte requested these saved for the use of police and military. Meanwhile, a lawmaker uttered that a law ought to be made on how the government should use the sequestered cars and suggested to just auction it otherwise, so the government will not anymore procure or buy one. “Dapat i-define na kapag confiscated in favor of the government, pakinabangan na ng gobyerno. Ito’y i-auction o kaya ipagamit na lamang sa mga taong gobyerno para di na nagpo-procure o bumibili ng sasakyan ang gobyerno,” said the lawmaker. Accordingly, Presidential Spokesperson Harry Roque, in response, said that the devastation of the smuggled vehicles just demonstrates the assurance of the President to prevent smugglers from additionally doing criminal acts. “That’s the decision of the president to send the message that we will never let smugglers profit from their criminal acts. We know that the alternative to destruction, they will always find a way to benefit from it, and that’s why by destroying it, there’s absolutely no likelihood that they will benefit from their criminal acts,” Spox Roque exclaimed.